The former global CEO of Chanel charts her unlikely path from literature major to global chief executive, guiding readers to move beyond the confines of staid expectations and discover their own true paths, strengths, and leadership values. Driven. Shy. Leader. Wife. Mother. We live in a world of categories — labels designed to tell the world, and ourselves, who we are and ought to be. Some we may covet, others we may fear or disdain; but creating a life that’s truly your own, means learning to define yourself on your own terms. 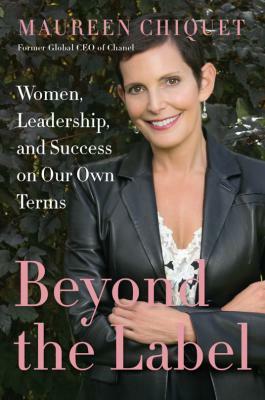 In Beyond the Label, Maureen Chiquet charts her unlikely path from literature major to global chief executive. Sharing the inklings, risks and (re)defining moments that have shaped her exemplary career, Chiquet seeks to inspire a new generation of women, liberal arts grads, and unconventional thinkers to cultivate a way of living and leading that is all their own. Through vivid storytelling and provocative insights, Chiquet guides readers to consider the pressing questions and inherent paradoxes of creating a successful, fulfilling life in today’s increasingly complex and competitive world. "Why should we separate art from business, feelings from logic, intuition from judgment?" Chiquet poses. "Who decided you can’t be determined and flexible, introspective and attuned, mother and top executive? And where does it state standing unflinchingly in your vulnerability, embracing your femininity, won’t make you stronger?" Wise, inspiring, and deeply felt, Beyond the Label is for anyone who longs for a life without limits on who she is or who she will become. Maureen Chiquet began her career in marketing at L’Oreal Paris in 1985. She has worked at The Gap, helped launch Old Navy, and was president of Banana Republic before becoming COO and President of US operations of Chanel in 2003. In 2007 she became its first Global CEO, where she oversaw the business and brand’s world-wide expansion. She left Chanel in 2016 to focus on writing, speaking, and developing new leadership initiatives. She is a Trustee to the Yale Corporation and fellow of Yale University, where she graduated in 1985. [Chiquet’s] advice will be especially resonant with a new generation of women inspired and empowered to create their own definitions of success and fulfillment. Beyond the Label is a revelation. I loved going on Maureen’s journey into her growing personal and professional awareness of feeling trapped in patriarchal structures. She illuminates empathy and emotion on her road to remaking her identity. In a world still dominated by masculine definitions of success, her female gaze disrupts, questions, and reinvents both her identity and that of women everywhere. Her book is spot-on. To me and to many others she is the ultimate role model-and not just for women. Thriving at work is an important part of thriving in life-and Maureen Chiquet has done it. Her passion for practicing empathy and embracing self-reflection sets her apart as a leader. Her book provides a practical, optimistic, and deeply human model for creating our own journeys of wonder and wisdom. Beyond the Label disrupts traditional definitions of what it means to be a leader and what it means to be successful. It bridges the gap between creativity and commerce, between self-expression and pragmatism, and between enduring values and the demands of an ever-changing marketplace. Read this book if you want to be challenged and inspired to find your own pathbreaking way to success.